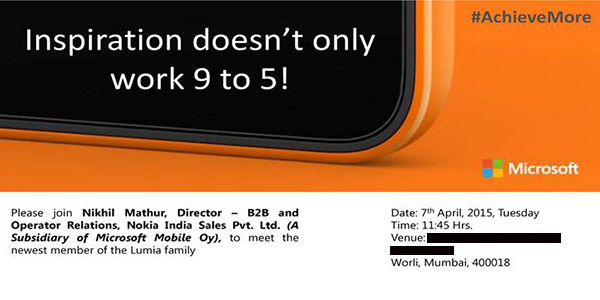 Yesterday, Microsoft sent out invites to members of media in India for the launch of Lumia 640 and Lumia 640 XL . The invite carries the following punchline: "Inspiration doesn't only work 9 to 5." Microsoft Lumia 640 features a 5" IPS ClearBlack display, Snapdragon 400 SoC, 1GB of RAM, 8GB of expandable storage, 8MP rear snapper with LED flash, 1MP front-facing camera, and 2,500 mAh battery. The Lumia 640 XL has a 5.7" IPS ClearBlack display packing the same hardware as the Lumia 640 albeit with a Carl Zeiss optics powered 13MP rear camera and 5MP front camera. Microsoft will certainly introduce dual-SIM variants of both Lumia phones. In India, the Lumia 640 is rumored to be priced at INR 9,999 ($161), while the Lumia XL will be priced at INR13,999 ($226). When Lumia 640 duel SIM available in Bangladesh? I am waiting for this phone. Please inform me. hey guys when will Nokia lumia 640 XL LTE launching.plz help me. nd which site I purchase.